Believe it or not, Big Larry had a hard time keeping his thoughts to himself. Turns out that even people inside Camp Clinton have been playing the never-ending stupid game of "Is Hillary Too Close To Wall Street?" According to a Politico investigation of hacked John Podesta emails released by Wikileaks, the schism over how hard Hillary should pretend to lash out at banks has been deep and real for awhile now. Unsurprisingly, it appears that Podesta (Bill Clinton&apos;s former White House Chief of Staff and Hillary&apos;s current campaign chairman) has found himself trying to balance the ying of 90s-era pro-finance Clintonian policy with the yang of a 2016 Democratic party spiritually led by Elizabeth Warren and Bernie Sanders. 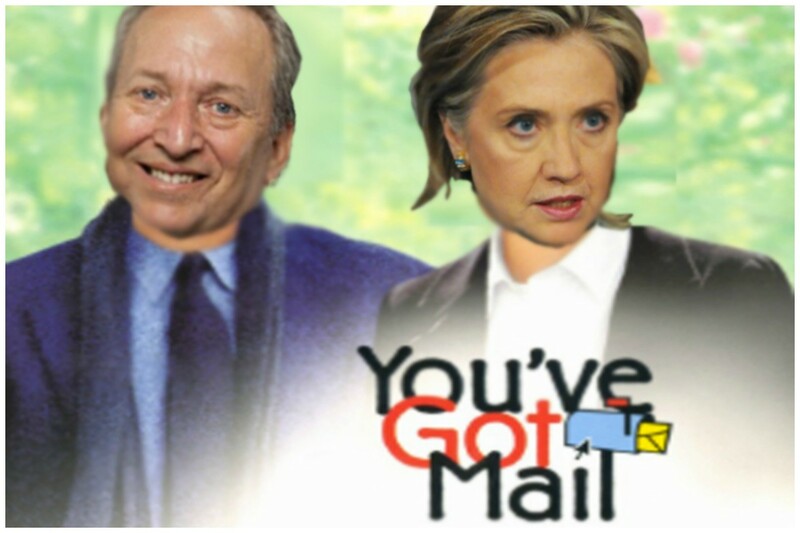 Former Treasury Secretary Larry Summers -- derided by the left for his role in financial deregulation during Bill Clinton&apos;s presidency -- tried to steer Hillary Clinton&apos;s campaign away from "bank bashing" during the Democratic primaries, according to the latest batch of WikiLeaks emails. Summers reached out to top campaign staff and even Bill Clinton himself after a Jan. 17 primary debate in South Carolina. During the debate, Clinton called out Bernie Sanders for voting in favor of a bill that kept part of the derivatives market unregulated going into the 2008 financial crisis. Hearing that Larry Summers had an idea about how to combat Bernie Sanders must have been like hearing that Justin Beiber had a plan to save Obamacare. Summers might not have been the last person Podesta wanted to hear from about the campaign&apos;s policy towards Wall Street, but he was pretty damn low on the list. "Worst advice ever," Podesta wrote to Bill Clinton chief of staff Tina Flournoy. "Wrong then, wrong now." But one has to question Podesta&apos;s certitude that Summers plan to ease up on Wall Street was wrong. Especially in light of her Goldman Sachs speeches coming to light, Hillary would be well-served by just coming clean about her relationships and knowledge of the finance sector. With her primary battle behind her and Donald Trump self-immolating every time he gets near a microphone, Hillary should be turning her attention to the passive-aggressive tango she will soon be dancing with Elizabeth Warren over her choices to run things like the Treasury and the Department of Commerce. The morning after the debate, Summers sent his thoughts to campaign aides, including chief financial officer Gary Gensler. Gensler also worked in Bill Clinton&apos;s Treasury Department but later became a financial regulator revered by the left for his crackdown on derivatives traders during the Obama administration. Summers said attacking Sanders for the 2000 derivatives bill was a "poor idea." He pointed out that Bill Clinton supported the bill, that Gensler could also be cast that way, and that Hillary Clinton herself had success trading derivatives. Warren is sweet as hell on Gensler to run Treasury, but there are more than a few who think that Hillary would prefer to put Blackstone&apos;s Tony James in that gig. It stands to reason that Warren would chain herself to the doors of the Treasury Department if Congress confirmed a guy like James, so Hillary would be wise to keep some balls in the air, and reminding the Sanderista/Warrenistas that everyone liked money in the 90s might be a canny way to keep things aloft. No, Hillary's economic team will not resemble an Elizabeth Warren fantasy regulation league roster. You know who else doesn't want to see a Hillary/Warren ticket? Hillary and Warren. When Bernie talks "banks," Hillary "giggles." Hillary Will Pretend To Bash Wall Street Because Iowa Has Caught A Nasty Case Of "The Bern"
What, Bernie doesn't have friends like Doug Band? Hillary is thinking that she needs to talk tough about cracking down on Wall Street... but not too tough. If you're a banker afraid of very vague threats, Bernie Sanders should be scaring the sh!t out of you. Can we stop with the "Is Hillary too close to Wall Street?" already? Of course she is, and it doesn't matter. Democratic Debate 2015: "The Glass-Steagall Magical Mystery Tour"